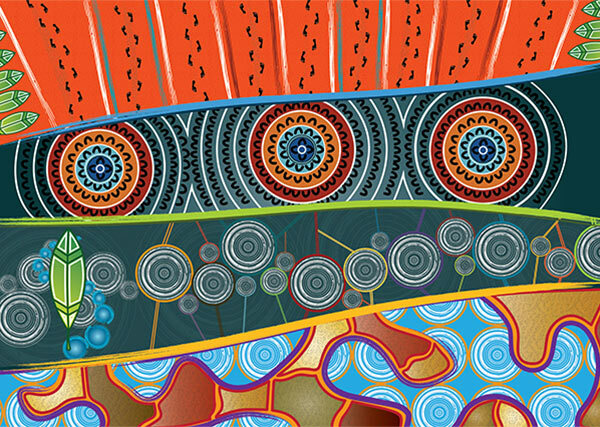 This newly formed Aboriginal Chronic Conditions Network (ACCN) will work to improve the experience and delivery of healthcare for Aboriginal people with chronic conditions in NSW. To achieve this, the ACCN will support the process of evidence-based reform by promoting and implementing new initiatives, frameworks and models of care. It will do this by enhancing and supporting the integration of care for Aboriginal communities accessing chronic care services in NSW in accordance with ACI values. Executive Committee Members : approx. 15 Network members, representative of the interdisciplinary membership, who will oversee the establishment of all projects and activities undertaken by the Network. Working Group Members: Network members appointed on the basis of interest and expertise to work on specific, time-limited projects and activities of the ACCN. The ACCN will collaborate to respond to priorities identified by Network members and key stakeholders. This artwork signifies the complex interrelations of health in our communities. Health is not something can be addressed in isolation or simply as an individual, and so the other factors of health need to be considered. The artwork represents the connection between individual health and health of our communities, culture and spirit. From top to bottom of the artwork we see the factors such as transience and tradition. Moving down the artwork to show solidarity, inclusion and community with the circles connecting people to place. The lower half of the artwork is a symbol of building trust, valuing community and our stories, working in collaboration and acknowledging our culture and social values. All of these elements underpin the work of addressing Aboriginal health disparities and the need to work together to improve health outcomes across the spectrum. Jasmine Sarin is a proud Kamilaroi and Jerrinja woman from NSW. She grew up on the South Coast in Nowra (Jerrinja and Yuin country) and Wollongong (Dharawal country) but have country influences from Coonabarabran in Central West NSW (Kamilaroi country). She is a self-taught visual artist and graphic designer. Jasmine’s artwork tells the story of her experiences growing up and her ongoing journey in this world. This allows Jasmine to share contemporary methods and concepts to make her contribution to the oldest living culture on this earth. Jasmine pays her respects to her elders both past and present and acknowledge that the land on which we work and play on was, is and always will be Aboriginal land.